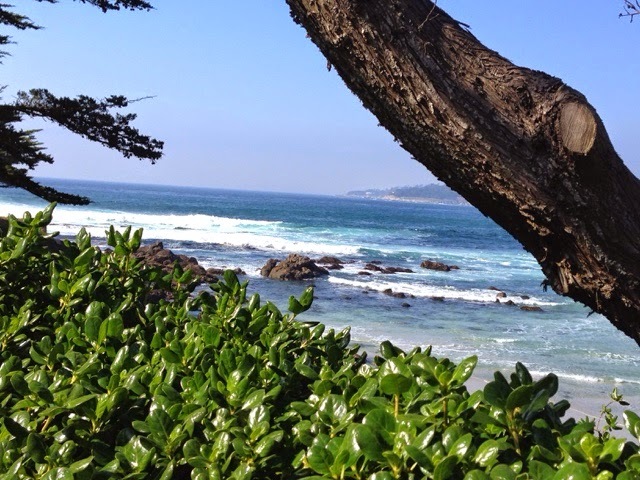 Today I explored Carmel By The Sea. The town is just short drive south on CA RT1 from Monterey. 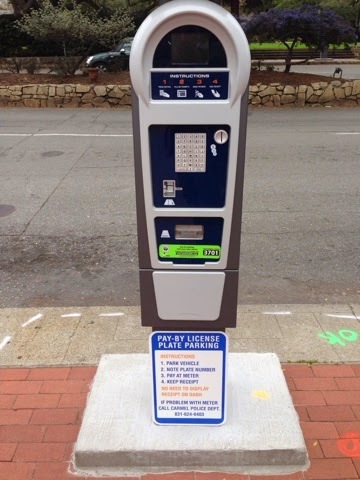 On the Main Street there is now a credit card parking system that the locals tell me they are not totally happy with. 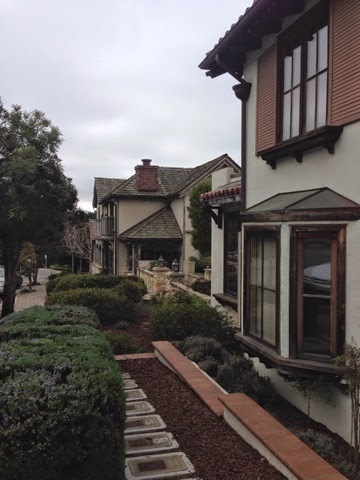 I like downtown Carmel for the variety of architecture and how it all plays together. One way you see spanish influenced design. In another direction you see Tutor. But first a stop at La bicyclette for something for breakfast. I was greeted by a woman with a warm smile when I entered. I told her I was here for a scone having seen it on the menu outside. 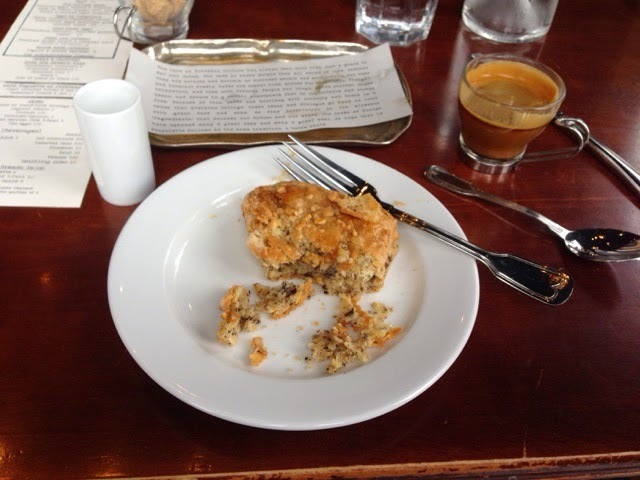 She said I could sit where I liked and pick a scone from under the covered dish and take it to my seat. I chose a seat in the front corner so I could see people coming and going as well as the activity of the staff. I was quickly waited on by Laura. She was young with dark hair and she immediately took my order and asked if I wanted my scone warmed. I did and decided on water and a cappuccino to go with it. I had been walking around a bit before I found this place. There are other places for coffee but I found what I wanted in a true cafe. 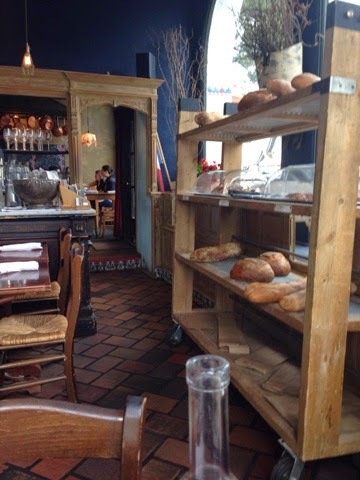 This is a Belgian family owned place with a definite European feel with lots of wood and the bread rack above. Laura was easy to talk to and she checked on me often and shared conversation. I was seated next to an older couple from Santa Clara that were friendly to talk to as well. 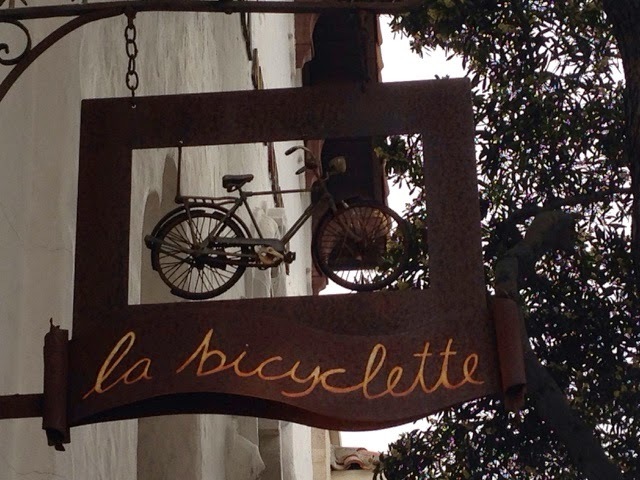 This was their first visit to La bicyclette too. 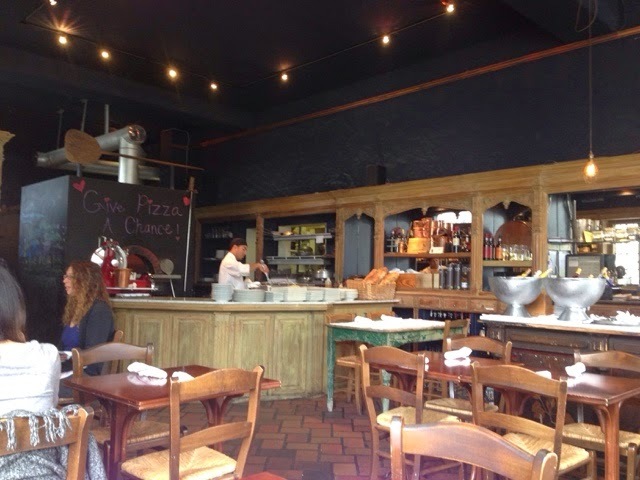 I seldom recommend places to eat but last year I recommended the Italian coffee shop in the Little Italy section of San Diego and I will add La bicyclette to my list of places I would head back to as I would like to now try their lunches. What I saw under my cappuccino on the serving plate was a typed explanation of a cafe with the social impact of what a true cafe is. I can only imagine that the owners have included it for the customer but in reality it is the philosophy of what they want the customers experience to be. 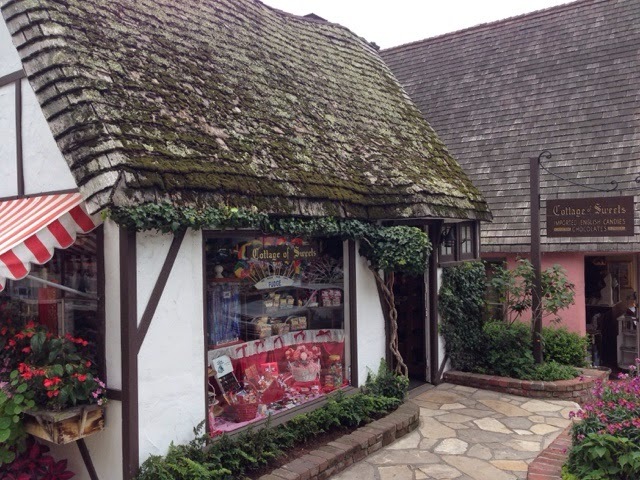 Leaving breakfast behind, I walked around the shops and I came upon this thatched roof shop selling chocolates. I found some chocolate seashells and chocolate rocks in small bags. These are wonderful gifts for my two Grandaughters. Shells to the oldest and rocks to the youngest. The saleswoman offered me a piece of chocolate layed fudge with cheesecake flavor. It was very good and bought a couple pieces to share. 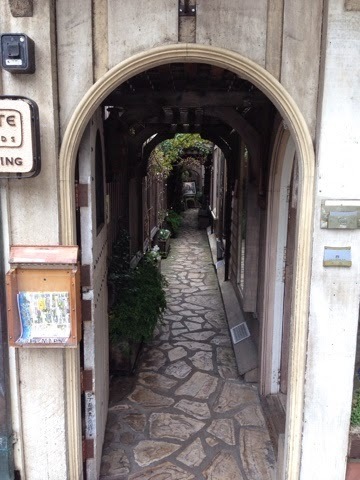 There are many wonderful narrow walkways in town leading to shops and restaurants in the back in courtyards. 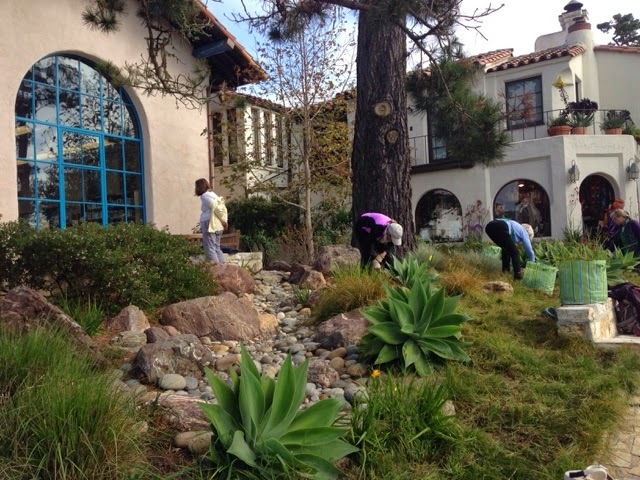 I stopped to talk to these woman weeding a garden. I started a conversation with Lori, who is about my age. 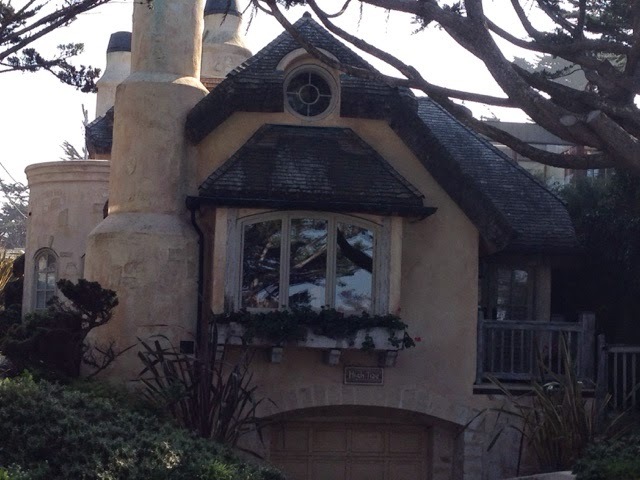 She is a member of Carmel By The Sea Gatden Club. This plot of land in front of the public library was designed by the club as a garden and now they maintain it. Today was a day for the removal of weeds that had come up after substantial rain. 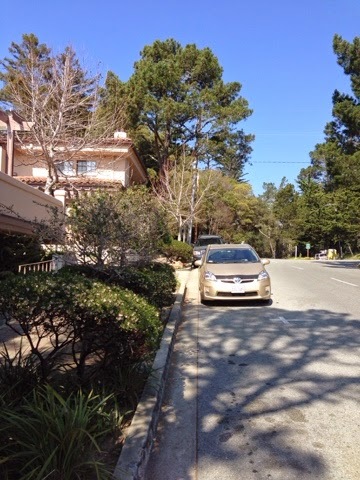 This is the same problem that my son is facing at his house in Monterey after putting down chips around the garden. The seed that lay dormant and invisible when dry, came to life with a substantial rain since last fall. The Garden Club maintains 3 gardens in town. Lori was working with a woman in her 80's who was handy with a telescoping tool that has a handle on one end and a combination hoe/3-prong tine. She would stab the ground with the tine and then lift the handle - pivoting the head and pulling up the weed with her quick motion. Very effective! I talked to the two woman for some time and eventually started to help them with collecting their debris bags of weeds. One of the things that I learned about them was that Lori's father went to college with this older woman and her husband, who met in college and eventually got married. After Lori joined the club and they were comparing notes and found the connection. With their gardening task done for re day, I was off to shop before lunch. 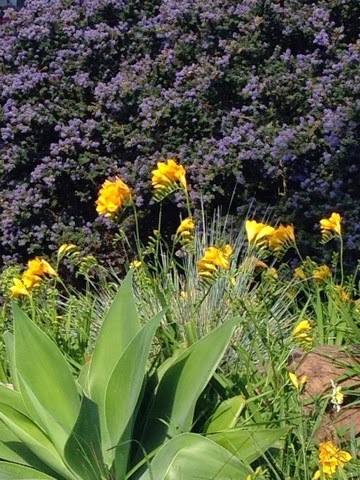 Here is a photo of the groups flowers. I stopped into a knife shop on a side street that had the finest assortment of high end sheathed and pocket knives I have seen. Many I would consider art while others functional. Prices ranged up to thousands of dollars. The man who worked there explained the knife blades that looked etched. He explained that the steel is in layers and when you look at the heavy edge you can see it. His best knives come from Japan. I was now back on the Main Street and stopped in a shoe store to try on a pair of ECCO's I got a reaction from the clerk when I told her I needed to try size 13. She told me that they have very few pairs in that size. It reminded me of a conversation many years ago with then the President of New Bsllance on a flight back to Boston. He told me that the shoe industry on the east coast cater to narrower longer feet and the further west you go shoes need to be wider and shorter and they know generally what to stock by region in the US. It was time for lunch so I decided to try The Forge on the side street I was parked on. I was seated promptly and provided good service. 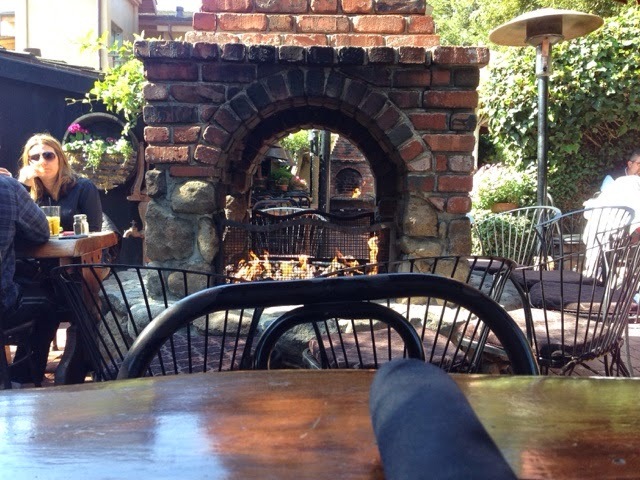 The atmosphere was nice sitting outside in a courtyard with a hearth with flames a few feet away. I chose the Chinese Chicken Salad. When it came with chopsticks I found it a pleasant surprise for my slow pased day. I normally eat very fast and people will ask if I even tased the food when they sit with me when I eat. 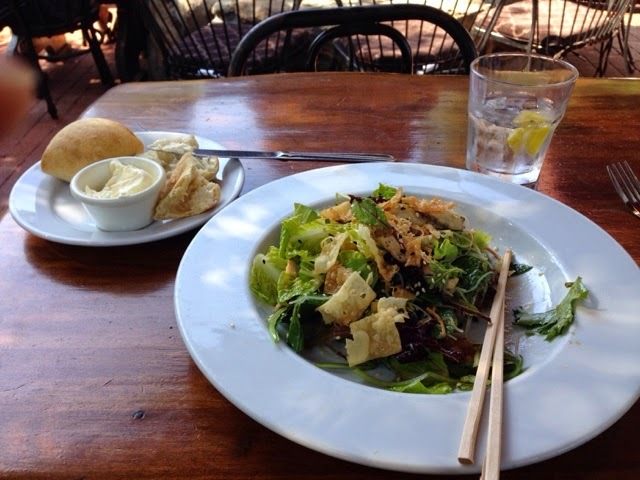 Today was a slow day using the chopsticks to select the pieces of food one by one to just enjoy the day in Carmel By The Sea. 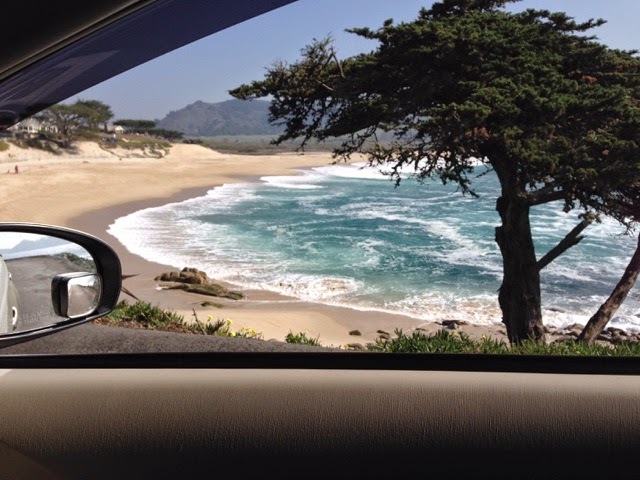 If it's Carmel By a The Sea then there must be water. 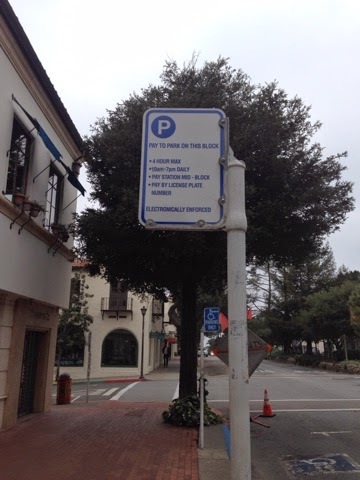 A few blocks down hill on the main street you come to the Beach / Pacific Ocean. 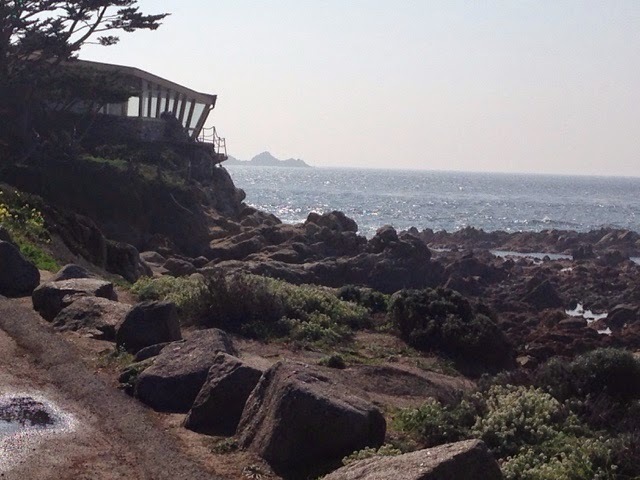 From the beach there is a one way scenic road heading south passing many very nice houses of all different design. And the variety of housing design was such a veriety. 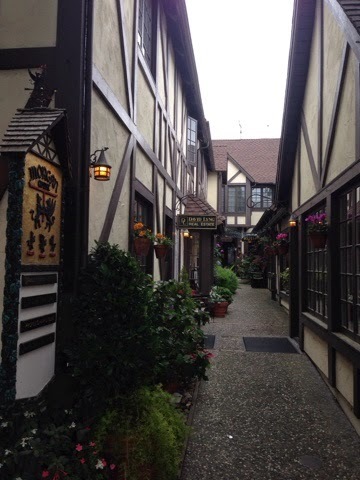 I can only give a small amount of the sights here in the blog. There is a lot of charm about living here and I can see why. 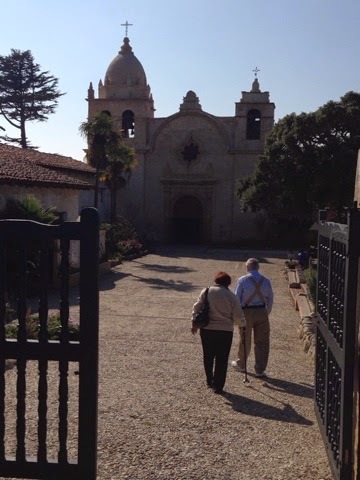 My visit to Carmel ends at the Carmel Mission/Basillica near where the scenic road ended. 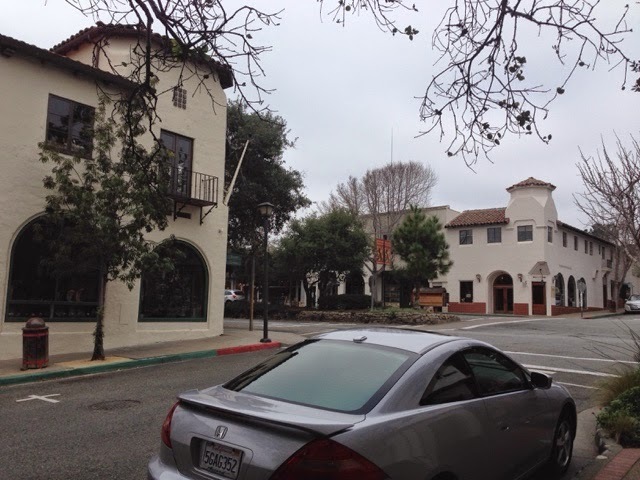 In the early years the Spanish Mission was a central focus of community life and there are many along the Cslifornia coast. 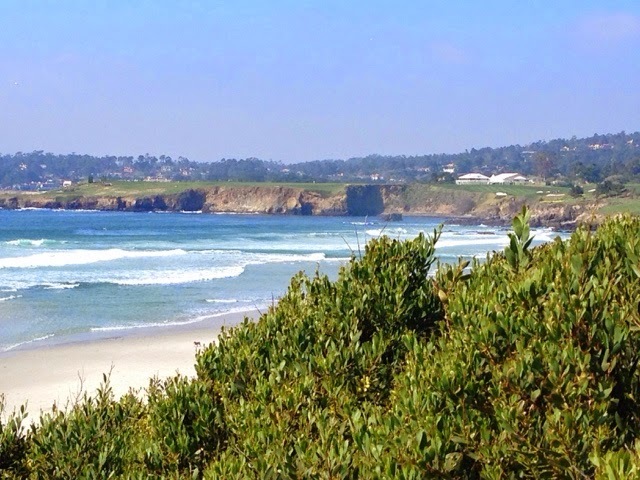 Carmel looks like a fun little town to visit! !